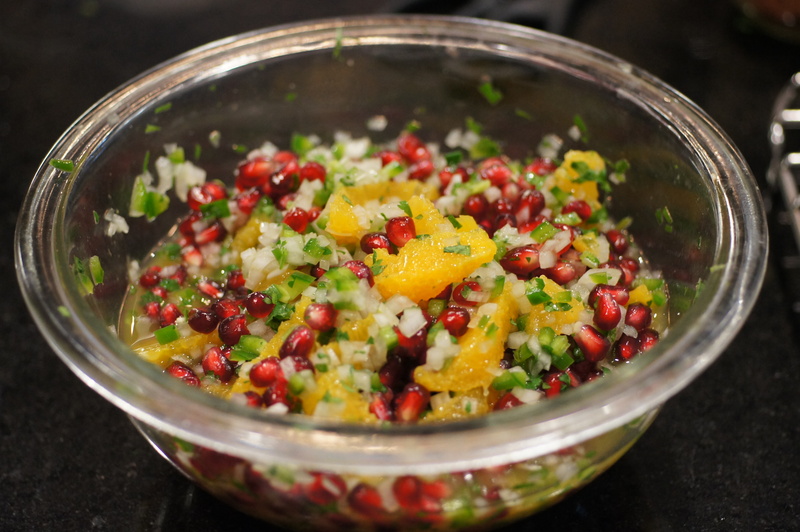 This recipe came about because I had picked a couple of the pomegranates and wanted to do something with them. 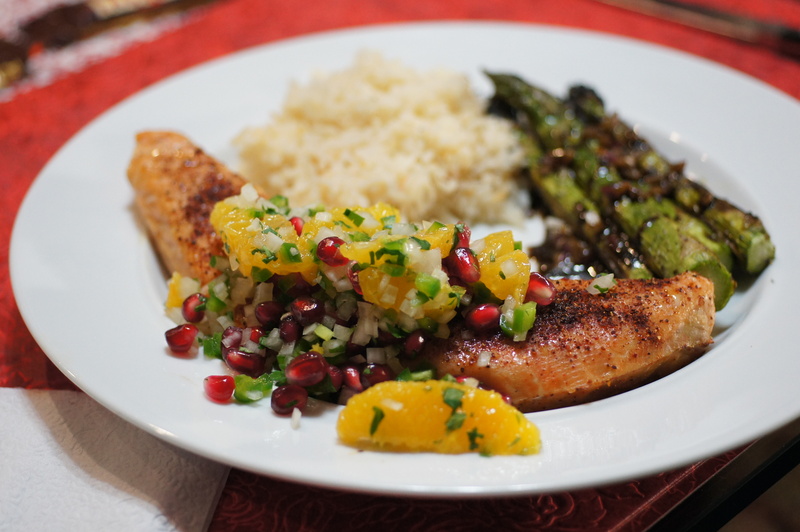 We had some nice Minneola Tangelos in the refrigerator and some beautiful salmon. 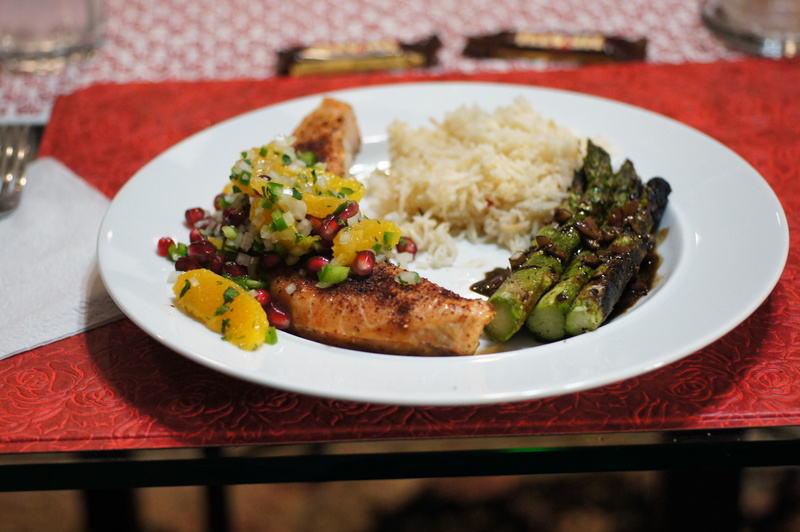 I didn’t want to glaze the salmon with the pomegranates because I wanted that little burst of flavor with each bite. We also did not want a salad. It was beautiful weather perfect for grilling so a salsa seemed the best way to go. This is what we did. Soak the cedar planks in water for a couple of hours. They say you can do it for 30 minutes but don’t believe them. You’re going to put these over a flame, remember? 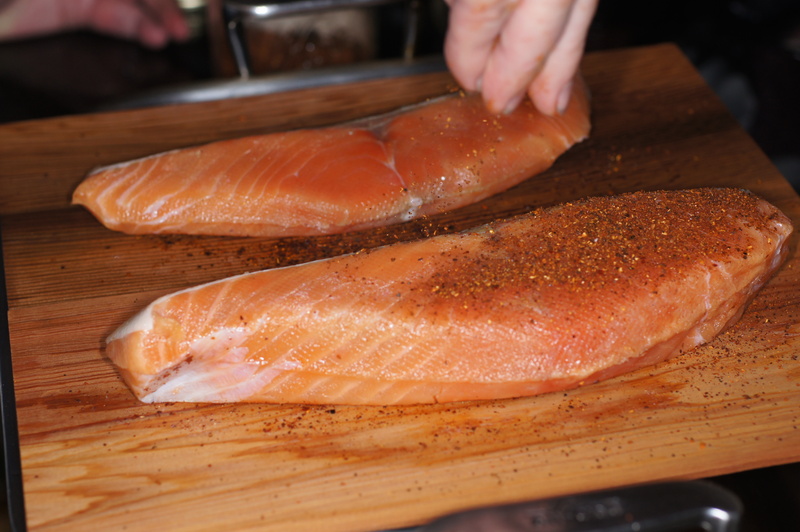 When ready to cook, place salmon filets on cedar planks and season them with ancho chile rub. 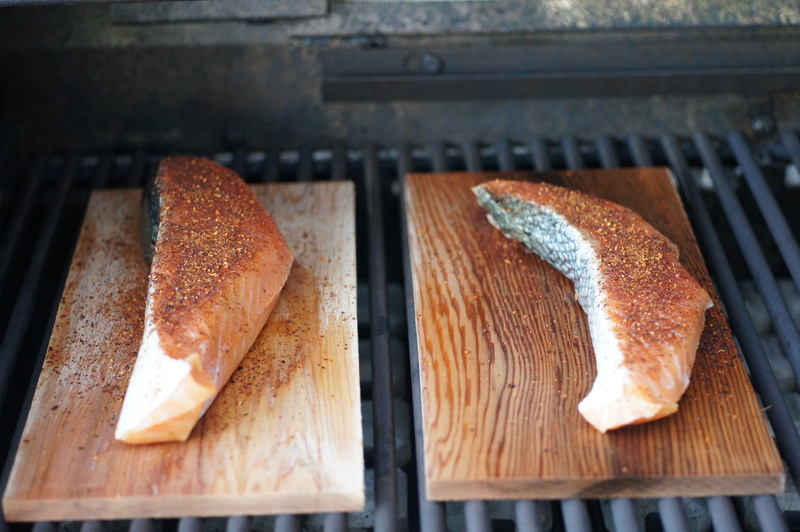 Place cedar planks on grill heated to 350 F.
Close cover and cook salmon on planks until done the way you like it, roughly 10 minutes for completely done depending upon thickness. 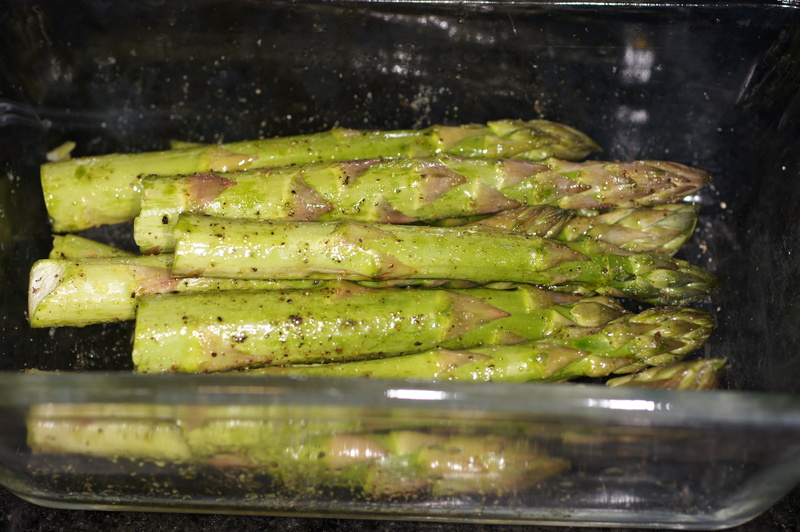 Toss the asparagus in some olive oil and season with salt and black pepper. When you put the salmon on the grill, place the asparagus on the grill, as well. 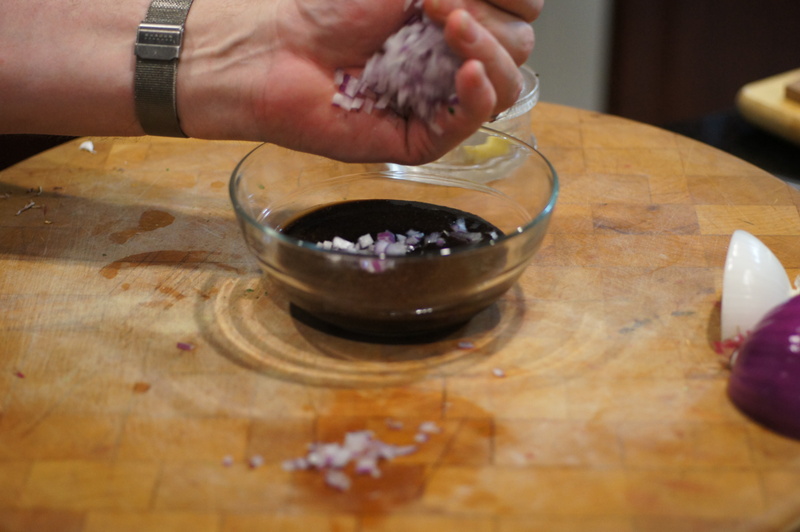 While the meal is cooking, add the olive oil and balsamic vinegar to a small blender and emulsify. 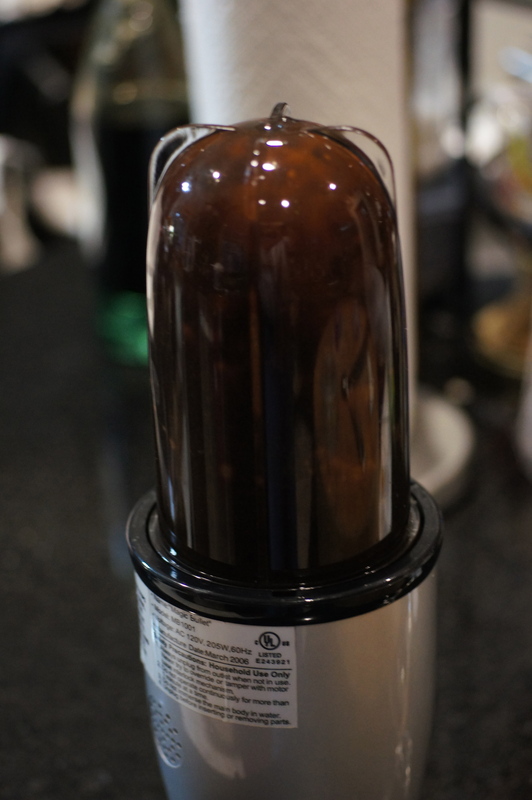 You can use a bowl and a whisk but a blender obtains better emulsification. By the time the salmon is finished the asparagus should be done as well. Plate the salmon. Top with the salsa. Place the asparagus on the plate and drizzle the balsamic vinaigrette over the top. Serve & enjoy! Thanks, Alice. All of our meals are a collaborative effort so I’m just as lucky as Baby Lady. When I met and married her, I became the luckiest man in the world. As for Thanksgiving, we really haven’t decided what to do. Typically, we keep it traditional with a turkey and such. Baby Lady does an incredible Turkey Roulade and her stuffing is to die for. There will be a cranberry side of some sort, perhaps cranberry cherry sauce? I make a mean zucchini bread that I only do during the holidays. We love my recipe for Braised Pearl Onions, https://remcooks.com/2012/01/31/braised-pearl-onions/. I also do a sour cream pumpkin chiffon pie. We will probably sit down together in the next week or so and plan out the menu. We will have Quickstep over for Thanksgiving dinner, if he is not working but it will be just us which alters the amount of food to prepare in the equation. This year will definitely be different. Thank you Richard! Can you share your zucchini bread recipe? 😛 I’ll check out the Braised Pearl Onions for sure! I will e-mail it to you. It is unbelievably good but something I will never post on the blog – it’s a very long story. There’s so much to like about this meal, Richard. 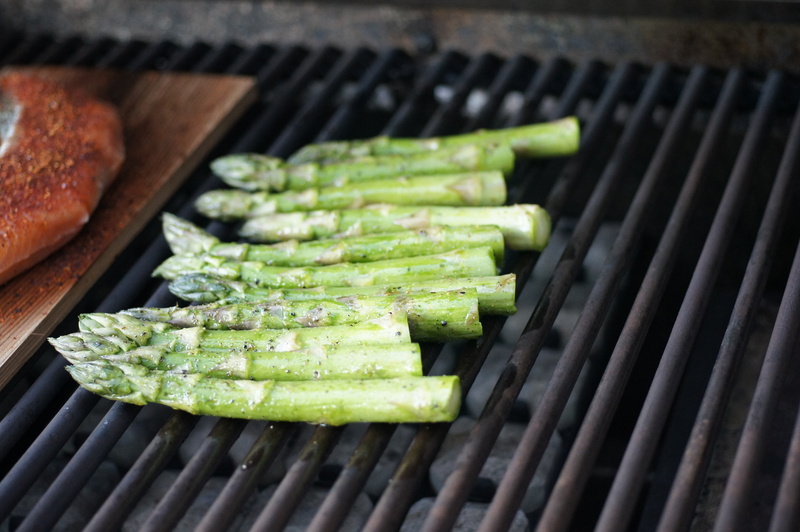 First off, there’s no better way to prepare asparagus than on a grill. Mine sits right outside my kitchen door and ridiculous as it seems, I’ll fire it up if I’ve got asparagus on the menu. I really enjoy planked salmon but never think of it — and I’ve got the planks! Lastly, this salsa of yours is the dish’s crowning glory. So fresh with so many great flavors. This is one great dish! Hi, John. Thanks for the nice compliment. We love asparagus either roasted or grilled. We hardly ever do it any other way, unless it’s the very small, homegrown ones which we throw in frittatas. You definitely need to use your planks. They’re fun and beat a grilling basket. If you’ve got them, there isn’t any reason not to use them. 🙂 The only problem with them is you have to think ahead to soak them. This is fantastic. I haven’t tried grilling asparagus before. I’ve only really started to like it the past couple of years. And I love the salsa! Thanks so much for the nice compliments. 🙂 You definitely need to try grilling the asparagus. It adds such a nice smokey flavor. 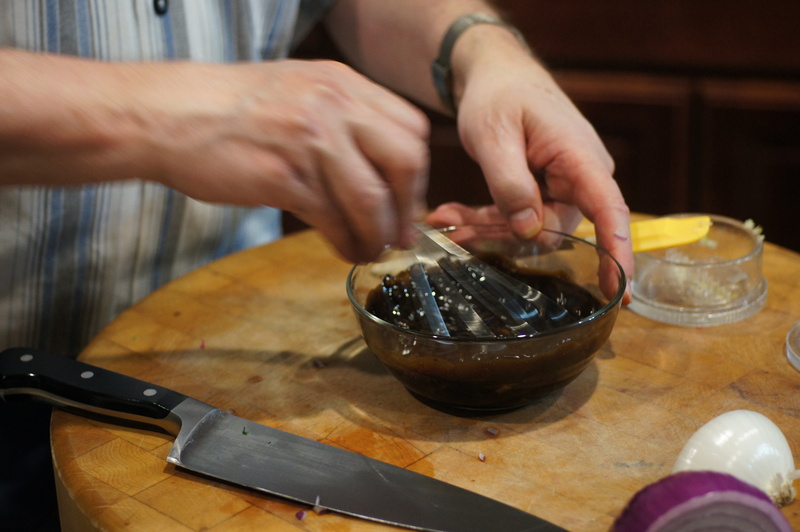 The balsamic vinaigrette we used to go with it was a perfect compliment to the grill flavor. You are welcome! 🙂 I do look forward to trying this technique. Hi Richard, the planks are new to me. Very good looking dish indeed. We have the weather you crave right now. The wind and rain are lashing the house as I type. Plenty of hearty stuff coming over the next few weeks. Hi, Conor. Grilling on planks has been the rage over here for 10 years, or so. You can use any of a myriad of wood planks depending upon the flavor you want to impart to your food. As it grills you get a nice smokey flavor from the planks. The cedar has an edge to it that goes particularly well with salmon. If you try it, make sure you get food grade planks because all other planks are chemically treated. They are now on my radar. Thank you for dropping by and your very nice compliment. I’m wishing it were 80 and still grilling weather up here. We’re steady in the 40s up in Wisconsin. I guess we could do some cooking over a bonfire… We’ve never grilled with planks like that. Is it much different than grilling with just the grates? There is a difference in cooking with planks as opposed to just grates. Because the food never touches the grates, you don’t get the brown crust on the meat. You also don’t have to worry as much about flare-ups, unless, of course, you don’t soak the planks. 😮 Also, cooking on planks gives you a nice smokiness that you cannot achieve with delicate fish any other way. If you use a smoker and indirect heat, you get too much smoke and the fish will tend to dry out. The planks provide just enough smokey flavor to preserve the flavor of the fish and keep it moist. Give it a try when it’s grilling time again. 🙂 Thanks for dropping by and commenting. Thanks Richard. This is really helpful. I think we will give it a go next year. OK…another FUN in the KITCHEN time! 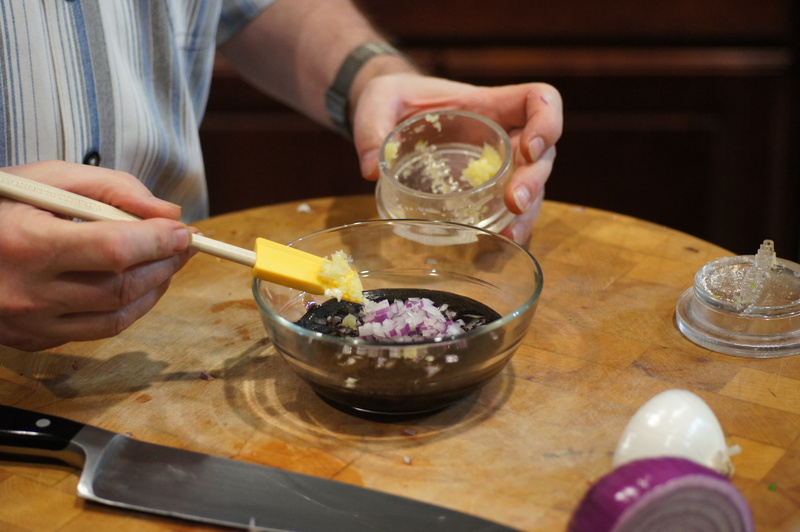 The ravings…”best salsa I have had in a long time!” Having so much fun creating from your blog! We made salmon and tilapia for the salsa! And, have to admit…. the kids wanted mashed potatoes and we couldn’t find tangelos, so used clementines. Totally DELICIOUS! We’re so glad you are enjoying the blog. We love doing it and are pleasantly amazed people read it and enjoy it. 🙂 Thanks for taking the time to drop by and post your very nice compliment. Lovely meal Richard. I’m not suprised there are chiles in it 😉 I’ve never tried a cedar plank because I heard mixed reviews. Thanks, Stefan. What can I say but I’m just a chilehead. 😉 You should try the cedar planks or adler wood or whatever wood just to give it a try. You may like it and you may not. I find the flavor of the salmon stands up well to the wood planks. I have a ton of cedar planks – you have inspired me. And, gosh, the asparagus looks amazing!